Parts manufacturer approval (PMA) components are the aftermarket parts of the aviation industry. Just like original equipment manufacturers (OEMs), PMA parts are also reviewed and scrutinized by the Federal Aviation Authority (FAA). PMA parts have been around for decades and recently become more common. This increased acceptance can be attributed to two factors: the reliability over the past few decades and the reduced price compared to OEM parts. As PMA parts become more common, the business case to develop low volume, complex and high value parts becomes more attractive. Important and critical to safe flight, components require significant scrutiny before the FAA will approve a design and subsequent manufacture. Accordingly, considerable testing and evaluation is required as part of a test plan. Our team of experienced engineers and scientists have the technical capabilities and expertise to help solve the toughest material challenges, both proactively and reactively. Lucideon’s vast knowledge of the aviation industry enables clients to progress efficiently though the part certification process. Physical testing of components is vital to understand how a material or part will perform and/or fail in service. For simple components, many companies have the equipment to perform testing and evaluations internally. As parts shift to increasing importance and complexity, companies often rely on external companies’ knowledge and capabilities to support the development, execution and interpretation of complex test programs. Lucideon manages full and partial programs to test and evaluate samples for a wide range of physical testing requirements, including at elevated temperature. 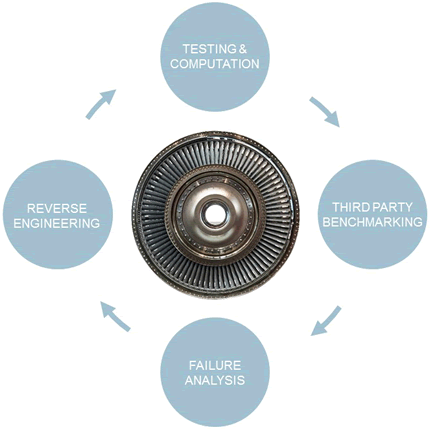 Example: Development and execution of thermal, mechanical and microstructural test programs to establish equivalency between PMA and OEM alloy systems. Establishing a meaningful point of reference is essential to aftermarket part development and benchmarking ultimately leads to the value proposition. Lucideon works collaboratively with clients to establish the baseline of a product and ensure that the correct properties and features are being evaluated and reported. Through this collaboration, Lucideon can provide consultation to determine application specific equivalency between parts and features. Example: Surface strain mapping using digital image correlation (DIC) to show relative component performance under application loading conditions. Experience is one of the most influential factors in the failure analysis process. Lucideon has the experience and analytical equipment to effectively identify the cause of failures. There are a variety of conditions that Lucideon can identify, provide context and characterize, for a multitude of materials and coatings. Example: Scanning electron microscopy (SEM) of fracture surface to characterize failure mode. There is more to reverse engineering a part than just identifying a material and taking dimensions. This statement is especially true for important and critical components. We have a deep understanding of the material science behind the processing and manufacturing of materials and by collaborating, can help you expedite your aftermarket part development. Example: Electron backscatter diffraction (EBSD) to determine grain structure of a superalloy.